Don’t get me wrong– this year’s formal Georgian Mansion is hardly a tear-down and it’s not like the designers shopped at Goodwill. It’s more that many showed a keen awareness of the challenging economic times as well as environmental issues, by using ingenious cost-saving measures and sustainable products. Also, this year more than half of the applicants were designers who had not decorated Showcase rooms in the past. So come and check outthese “newbies” that represent many of the Bay Area’s next generation of talented designers. 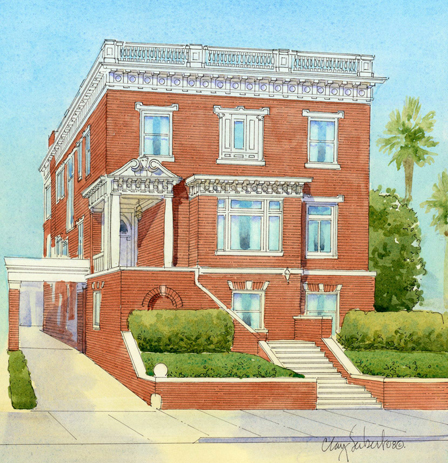 The four-story mansion at 2839 Pacific,(one of the biggest lots on the block) was built in 1910 by S.F. architect Nathaniel Blaisdell, and features a penthouse wrap-around terrace that offers breathtaking Bay views. Some of my favorite looks were J. Weiss Design’s dramatic kitchen makeover, sporting a huge sculptural light fixture, large-scale landscape photos, and a haunting “Phantom” window. Leverone Design’s family room made judicious use of the natural light by using the perfect shade of gray on the walls, showcasing his textural use of wheat, straw, linen and leather in flowing organic shapes. And what fashion-consious teenage girl wouldn’t fall inn love with Nancy Van Natta’s Coco Chanel inspired bathroom- complete with Chanel quotes and perfume bottles etched into the glass shower. For more details see website.